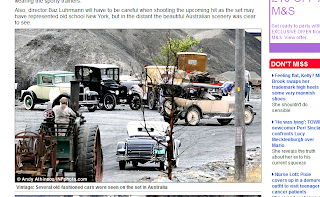 While the News Corp Daily Telegraph is bringing the world exclusive snaps from the set of The Great Gatsby and tales of Leo DiCaprio's weekly new handbag girlfriend, the Shuttle's on-set spy has been supplying us with a few tidbits. As we exclusively reported a few weeks ago, the singer Jeff Duff has been cast in the movie as a friend of Jay Gatsby (apparently director Baz Luhrmann has been telling friends that Duffo-as he was once known-exemplifies the sort of eccentric character Baz aspires to). 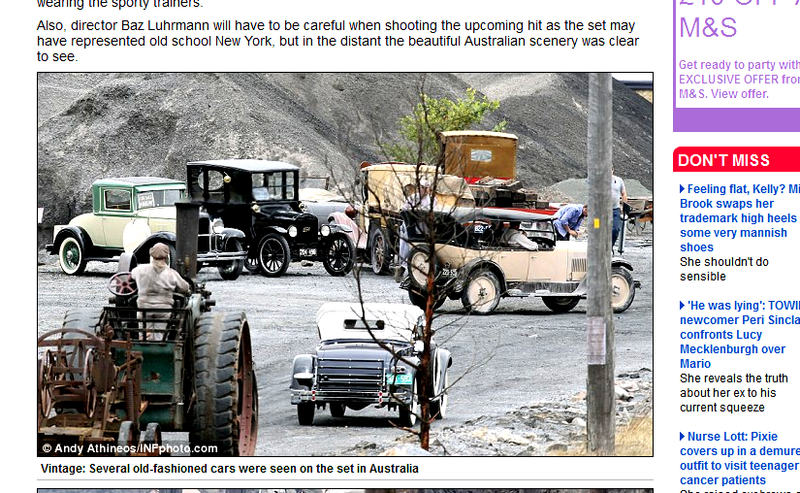 Now we have noticed a glaring gaff spotted in a series of snaps from the set, that were featured in the UK Daily Mail (courtesy of News Corp). 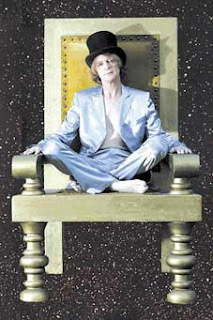 The originals can be seen here and we re-produce a couple of screen shots. No, it isn't the beat-up about Tobey McGuire looking very smart in 1920's gear topped with a boater and wearing a pair of 2011 Nikes. 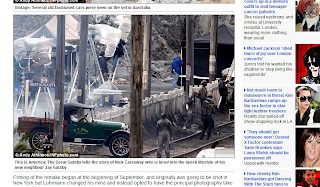 (our spy says the snaps were taken as Tobey wandered around in between takes and he had slipped of his movie shoes). It's the series of splendid 1920's automobiles. Each one of them is a right hand drive vehicle and of course, in the USA cars are left hand drive. Is this a first for the fans of movie mistakes who scour the flicks and to date, have clocked up as many as 600 similar mistakes in the Harry Potter movies, over 300 in Pirates Of The Caribbean and about 260 in just one Lord of The Rings film?. It makes the famous scene from 1959 Ben Hur where a trumpeter is spotted wearing a modern watch pale into insignificance. Perhaps the viewers will never notice. 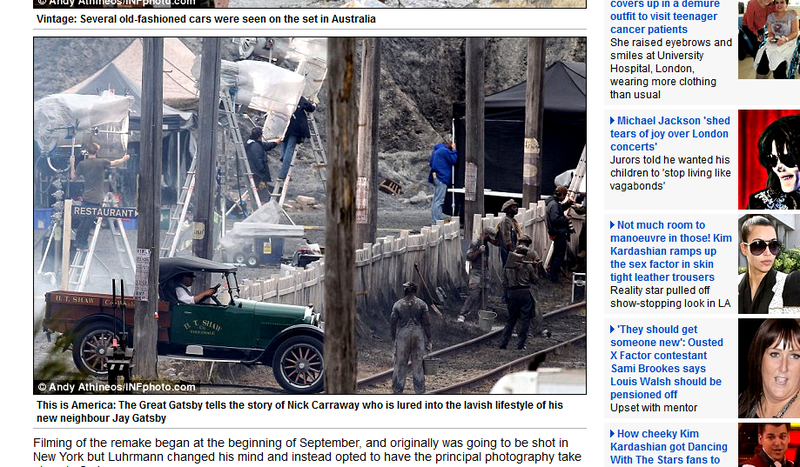 But then again, The Great Gatsby is being filmed in glorious 3D.